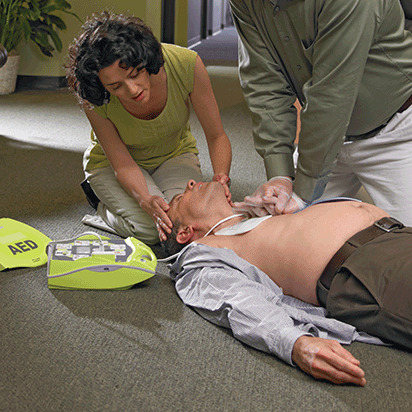 The Adult First Aid/CPR/AED Online course will prepare you to recognize and care for a variety of first aid, breathing and cardiac emergencies involving adults. The course features award-winning simulation learning – an interactive experience where you will respond to real-world emergencies in a virtual setting. This course requires a PC or tablet with a high speed Internet connection. This course is not supported on smartphones. This course does not work with Internet Explorer. Allow approximately 2 hours 10 minutes to complete the course. This course does not meet OSHA requirements for workplace certification. The Adult, Child and Baby First Aid/CPR/AED Online course will prepare you to recognize and care for a variety of first aid, breathing and cardiac emergencies involving adults, children and infants. The course features award-winning simulation learning – an interactive experience where you will respond to real-world emergencies in a virtual setting. This course requires a PC or tablet with a high speed Internet connection. This course is not supported on smartphones. This course does not work with Internet Explorer. Allow approximately 2 hours 45 minutes to complete the course. This course does not meet OSHA requirements for workplace certification. Designed for those who are at risk for on the job exposure to blood and other bodily fluids in the workplace. The course teaches staff how bloodborne pathogens are spread, how to avoid exposure and what to do if exposed to infectious material. This course is one of the requirements of the OSHA Bloodborne Pathogens Standard. After taking this course, students should talk with their employer about their workplace’s specific policies and procedures. Those who complete the training receive a Bloodborne Pathogens Training certification valid for one year. You should meet with your employer representative to learn about specific policies and procedures and answer questions about how this training content applies to your workplace. The First Aid Online course will prepare you to recognize and care for a variety of first aid, breathing and cardiac emergencies involving adults, children and infants. The course features award-winning simulation learning – an interactive experience where you will respond to real-world emergencies in a virtual setting. This course requires a PC or tablet with a high speed Internet connection. This course is not supported on smartphones. This course does not work with Internet Explorer. Allow approximately 1 hour 35 minutes to complete the course. This course does not meet OSHA requirements for workplace certification. The Child and Baby First Aid/CPR/AED Online course will prepare you to recognize and care for a variety of first aid, breathing and cardiac emergencies involving adults, children and infants. The course features award-winning simulation learning – an interactive experience where you will respond to real-world emergencies in a virtual setting. This course requires a PC or tablet with a high speed Internet connection. This course is not supported on smartphones. This course does not work with Internet Explorer. Allow approximately 2 hours 25 minutes to complete the course. This course does not meet OSHA requirements for workplace certification. The First Aid for Opioid Overdoses Online course will provide you with the knowledge and confidence you need to respond to a suspected opioid overdose emergency. You will learn to identify the signs and symptoms of a suspected opioid overdose and then the appropriate care to provide based on the responsiveness of the person. This course includes information on how to use several different naloxone products -- a nasal atomizer, Narcan ® and EVZIO ® -- to reverse the effects of an opioid overdose. This interactive course includes audio and video and takes approximately 45 minutes to complete. You must pass a final quiz to complete the course. The First Aid for Severe Bleeding Online course will prepare you to recognize severe, life-threatening bleeding emergencies and to take action to stop the flow of blood. You will learn how and when to control bleeding by applying a tourniquet and hemostatic dressing. This interactive course includes audio and video and takes approximately 30 minutes to complete. You must pass a final quiz to complete the course. Course is designed for tattoo artists who are at risk for on the job exposure to blood and other bodily fluids in the workplace. The course teaches staff how bloodborne pathogens are spread, how to avoid exposure and what to do if exposed to infectious material. This course is one of the requirements of the OSHA Bloodborne Pathogens Standard. After taking this course, students should talk with their employer about their workplace specific policies and procedures.Those who complete the training receive a Bloodborne Pathogens Training for Tattoo Artists certification valid for one year. Please check to see if this course meets your state's regulations before registering. In addition to this training, you should meet with their employer representative so he/she can inform you about specific policies and procedures and answer questions about how this training content applies to your workplace. You love your pets, and want to give them the best life possible; being equipped to deliver first aid and provide a healthy lifestyle for your pet is the best way to do that. In this course, you will learn the basics of providing first aid care for your cat or dog, and will learn how to best give care for common emergency situations. This 35 minute online course covers understanding your pet's vital signs, breathing and cardiac emergencies, wounds and bleeding, seizures, and preventative care for cats and dogs. This course is desktop and tablet compatible. This online course will teach you the signs and symptoms of anaphylaxis and how to care for a person having a severe allergic reaction, including how to administer epinephrine using an auto-injector device. The course, which includes video, activities that reinforce key information and a learning assessment, will take approximately 30 minutes to complete. Upon registration, you will receive an email with information on how you can request a free EpiPen® (epinephrine) Auto-Injector training device. Not optimized for Google Chrome browsers. This course, developed by the American Red Cross and the National Federation of State High School Associations, gives students an overview of first aid and 'best practices' for many first aid situations encountered by coaches. Students learn skills related to athletic injuries that may also be useful for injuries to officials, fellow coaches or spectators. Topics include: Checking an Unconscious Athlete; Asthma; Sudden Illness; Heat Related Illnesses; Wounds; Injuries to the Head, Neck and Spine; Psychological and Mental Health Problems. Students who score at least 80% on the course assessment may print a record of completion. Because CPR and AED require separate training for certification, these topics are not part of this course. Students are encouraged to register for the American Red Cross CPR/AED course as a complement to this course. For optimal viewing of the course, please use: Chrome 12 or higher, Firefox 10 or higher, IE9 or higher, or Safari 4 or higher.